We get asked this question a lot. Both from our clients and from fellow professional detailers. Because the two scenarios require different tools I’ll be breaking it down into two sections: Machines for the DIYer, and machines for the Professional Detailer. I’ll be ranking machines I have used, both on the factors above, and on other various information. First I’ll cover the needs of a DIYer. Those of you who wash your personal vehicles on the weekends need something that’s easy to use and reliable. Most people washing 1-2 vehicles per week don’t really need a $1000-2000 machine. You can get by with something a little less expensive and invest the savings into a DI water filtration system or other detailing related tools and products. My favorite entry level machine is the Greenworks 2000 PSI Electric Pressure Washer. Last year I purchased several of the discontinued version of this machine due to several reasons. First being that it’s a “cart style” machine so it’s very stable versus other entry level machines. The Greenworks pressure washer has standard M22 14mm fitting, meaning it’s very easily adaptable to a longer hose and better pressure washing gun/wand. It’s not the quietest machine, but it is far quieter than a gas pressure washer. The wand that comes with the machine works well and has a fitting on the end for standard nozzles in case you want reduced pressure. This pressure washer is rated at 1.2gpm and 2000psi. The next step up is going to be the Comet 1700 Pressure Washer. This pressure washer is currently on backorder and Obsessed Garage is probably your best bet to getting one as quickly as possible. I’ve had this machine a little over a year now and I can say it works well. I like that it’s a wall mountable unit and that it’s a much higher build quality than the Greenworks. That comes at a price though, this one is right at $600. It flows nearly twice as much as the Greenworks, but I’d say it’s a little louder. I don’t like that the wand on this one has a “pinch style” tip rather than a quick release standard style tip. This pressure washer is rated at 2.1 gpm and 1450psi. Another great Mid-Tier electric pressure washer is the AR Blue AR630. I’ve had this unit for a few months and I knew as soon as it arrived that it was a quality machine. The weight of the unit is impressive to say the least. One of the really cool things is this pressure washer is tiny, It’s really just the motor and the pump, no card or big plastic housing. The wand that comes on this unit is similar to the Comet. I haven’t measured psi and gpm on these units, but based on feel I think this one has a little more flow and a little more pressure out of the box. This pressure washer is by far the quietest of the bunch, scary quiet really. The one I have linked is the TSS version, which means the motor stops running when you let go of the trigger. They also sell one that doesn’t have this feature, and also one that you can run hot water through (up to 180 degrees) so make sure you buy the one that fits your needs. This pressure washer is rated at 2.1gpm and 1900psi. Now to the professional grade stuff. 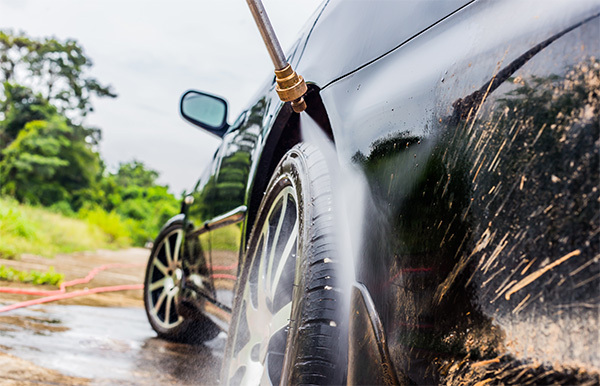 Any of the pressure washers mentioned above will work for professional auto detailing, but durability in a full-time environment can be questionable on a lower grade unit. By going to a higher end unit you’ll get guaranteed reliability and more gpm/pressure for more efficient cleaning. My first professional grade electric pressure washer for auto detailing was the Karcher Mid Class (commercial cold water electric pressure washer). The Karcher I have is rated for 2000psi at 3.0gpm. The 3 gallons per minute really has a big impact on cleaning ability and efficiency. This machine runs on 220v so make sure you’re equipped to plug it in or speak to an electrician about getting a plug installed so you can run this machine. Karcher only sells through exclusive dealers so check their dealer locator to find a location near you. The next professional grade option I actually don’t have. But with all the research I’ve done I can assure you this is a solid choice. The Kranzle 1122TST is a solid machine and Matt at OG has done all the hard work to put together a complete, ready to go, setup. It flows 2.1gpm, which is just over the Comet and AR pressure washers, but still runs at 110v. It does require a 20amp circuit so make sure you’re properly equipped ahead of time. This is a strong unit that can draw from a stationary tank if you’re a mobile detailer, and it also works great from a garden hose if you’re working from home or in a shop. This pressure washer is rated for 2.1gpm and 1400psi. No matter which pressure washer you go with I have to recommend the Mosmatic swiveling gun from Obsessed Garage and all the accessories like hoses and fittings. Matt has done a wonderful job putting together options for us so we don’t have to go through the trouble of testing and throwing money away on stuff that doesn’t work. PREVIOUS How much for an interior detail?